General Lamps Blog - Should Schools replace their existing Fluorescent Tubes or invest in new LED Panels? Should Schools replace their existing Fluorescent Tubes or invest in new LED Panels? Since writing this the cost of LED panels have dropped dramatically, changing the results of the calculations found below. You can see the more recent version here. It’s a question we hope everyone who is responsible for lighting in Schools is considering; should we change the fluorescent tubes that we have or should we splash out on some new LED Panels? Which is going to save us the most money? It’s a tough one because fluorescent technology already is a very good energy saving source, with long life and cheap replacement costs. But LED’s produce comparable light output and their cost has plummeted over the last 12 months making LED panels much more affordable, so it’s game on. 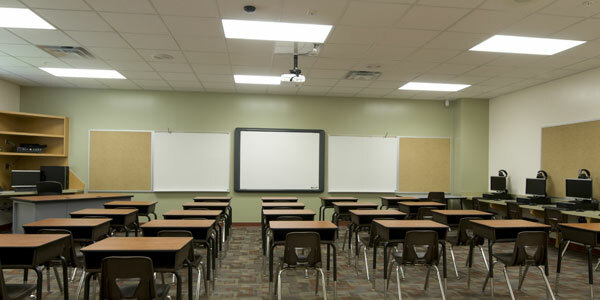 An average Classroom will have around 20 light fittings in place. To compare like with like we will use a 600 x 600mm lay in module for each type as this is the most common classroom light fitting. Each 600 x 600mm module will have 4 x 2ft 18w Fluorescent tubes so our classroom will have a total of 20 x 4 = 80 tubes. Each Panel will cost £59 for a 40w lay in 600 x 600mm module; a direct replacement for the Fluorescent fitting that is currently being used. So we can see that over a 1 year period it would be a better option to just replace the fluorescent tubes as the additional costs of installing LED Panels will be £1348.27 - £470.46 = £877 more expensive in the first year. However you are saving £302.46 - £168.27 = £134.19 per year in electricity. So if we divide the cost of the LED panels by the annual saving we can get the amount of time it will take for us to recover our investment (also known as payback time). But our LED panels last 45,000 hours or 23.47 Years with the lights on for 9 hours per day. So after around 8 ½ years we will have recovered our initial investment and we can look forward to another 14 ½ years of energy efficient lighting saving us £134.19 every year. When compared to our old fluorescent tubes this is not bad at all, plus with the extra life of the LED maintenance is reduced meaning your facilities management team can focus on other things instead of changing those hard to reach lights. The numbers we have shown here are our own estimates so don’t forget that if you have your lights on longer than 9 hours a day, your open for more days a year, or both, then the saving on electricity each year becomes greater with LED, reducing the payback time. The decision to stick or twist with LED Panels v Fluorescent tubes is really a case of weighing up how long you expect to keep your light fittings for. If it’s more than the payback time (in our example this came out as 8 ½ years) before you change your lighting then LED Panels are the way ahead. However if you expect to change your lighting more regularly then sticking with fluorescent tubes is best.